James Wan didn’t reinvent the supernatural horror film with 2013’s The Conjuring, but his assured direction certainly elevated the tropes. While using all of the requisite bumps and whispers in the night, Wan took the necessary amount of time to build the tension to white-knuckle level before hitting us with the “boo!” scares, crafting one of the most anxiety-inducing films of recent memory. In The Conjuring 2, he takes a bit too much time to get to the goods. At over two hours long, the sequel is packed with unnecessary story elements and is repetitive in its presentation of haunting staples, exposing a lack of plot ingenuity that’s out of sync with Wan’s high-minded, often gorgeous composition. By the time we finally arrive at a rushed climax, patience is strained almost as much as nerves. 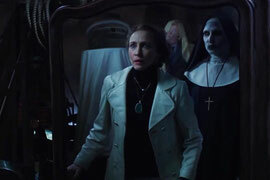 The Conjuring 2 again draws from the actual casefiles of real life paranormal investigators Ed and Lorraine Warren (Patrick Wilson and Vera Farmiga), boldly opening with a prologue involving the much-filmed Amityville haunting. To the movie’s credit, it has an interesting take on the topic. Unfortunately, it also sets up a contrived through-line for Lorraine that pits her against a demonic nun. The bulk of the movie deals with the Enfield Poltergeist, in which a family in England was plagued by a phantom in the late ‘70s. Single mother Peggy Hodgson (Frances O'Connor) lives in a cramped, dingy townhouse with her four children, including young Janet (Madison Wolfe). An angry spirit takes a shine to Janet, terrorizing and possessing her. As the case hits the media, it eventually gets the attention of the Catholic church and the Warrens. Ed and Lorraine head across to pond to verify the paranormal activity and assist the frazzled family. It takes about an hour of screen time for the Warrens and Hodgsons to come together, and the movie bounces back and forth between the two families in an overlong first act. Wilson and Farmiga are both very good and imbue their characters with necessary likeability and credibility, but the Warrens are much more interesting when they’re actually ghostbusting instead of just talking about ghostbusting while painting and reading in their suburban home. The Hodgson house falls into a familiar pattern of escalating activity over the course of several nights. There are lots of loud knocks, more than one toy that gets a life of its own, etc., etc. At least they’re smart enough to go shack up with the neighbors after mom’s convinced something weird is going on. Wan still shows the patience to craft a good scare, with several standout technical moments. The Amityville sequence is spooky, as is a scene where Ed interviews Janet. He’s in the foreground with Janet out of focus in the background and some serious creepiness ensues. There’s also a great continuous shot at the beginning of the movie that sets up the architecture of the home (much like the first movie), so we have our bearings when the craziness goes down. Sound design throughout is impeccable. There’s just not quite enough to burrow deep under the skin or into the psyche. The evil nun and old man aren’t particularly frightening or original (just check out 1977’s The Sentinel for more examples of both). The “why are they doing this” backstory is standard, and, in the case of the nun, saved for a clunky third act wrap-up that makes little sense. It’s also disappointing when shoddy CGI appears to drain the menace from the malevolent beings. This mirrors the “too much” approach to the narrative. In addition to the standard fare, there’s a half-baked idea involving skeptics who don’t believe what’s happening in Enfield – though it was nice to see Franka Potente (Run Lola Run, The Bourne Identity) on the big screen again – and attempt to connect it with Amityville. The movie also pauses for asides on several occasions, including Patrick Wilson singing an entire Elvis song to the Hodgson kids. In the middle of a supernatural horror movie. The Conjuring 2 has the meat; it’s just surrounded by a lot of fat that doesn’t allow for a consistent, lively atmosphere of dread. 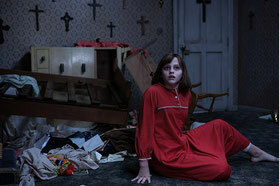 The filmmaking spirit, and the spirits, are much less intense in this conjuring.